I will review your ORIGINAL Music Single, Ep, Album or Mixtape and publish it to our massive readership and over 300k Twitter followers and 50k Facebook Fans at the prestigious and independent online JamSphere Music Magazine. +++Jamsphere is Read, Followed and Respected by fans and industry pros alike. OurReviews are Passionate, Honest and Unbiased giving your music theProfessional Attention it deserves. +++ INCLUDED!!! We will embed your choice Soundcloud, Datpiff or Reverbnation music widget and Youtube, Vimeo, or Vevo videos together with links to your homepage, sales and social websites! +++ NOW - Get into our PRINTED HARD COPY MAGAZINE delivered to Record Labels, Industry Professionals and door-to-door to fans WORLDWIDE!!! +++Front & Back Cover EXTRAS INCLUDE 2-page feature spread inside the printed magazine. +++Back cover EXTRA dedicated to choice "ARTIST OF THE MONTH" contact me for approval. +++For Cover Extras contact me for availability. +++We help kick-start careers, certify web presences and increase credibility. 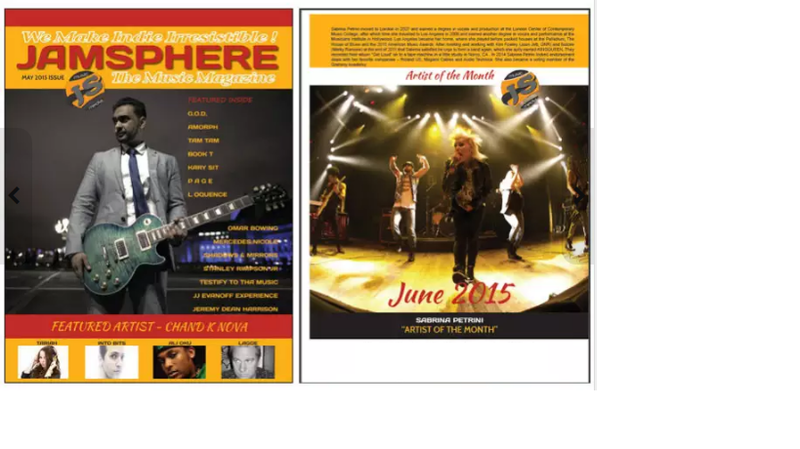 review your Original Music on Jamsphere Magazine plus tweet to 200k twitter fans is ranked 5 out of 5. Based on 4 user reviews.